An American mink (Neovison vison) stares down from its perch on a branch. I have been thinking about this story and its lesson since it was relayed to me a few months ago. 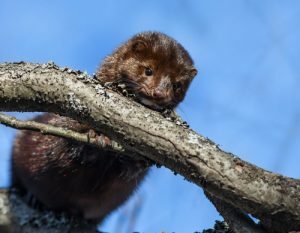 In the 10 years that I was based at Winton Woods as a Nature Interpreter, I had heard about mink living down near the Kingfisher and Great Oaks Trails, but had never witnessed their presence until a little over a year ago. I was walking on the lower half of the trail by the creek. It was springtime, and life’s newness was popping out in fresh greenery everywhere. It was a perfect habitat to support the elusive American mink (Neovison vison). I had witnessed tracks in the snow across the frozen creek, but had never seen the long, furry critter until that day. The mammal trotted about 10 feet near the water’s edge, probably hunting, and then disappeared. I was so surprised by it, that at first, I wasn’t sure what I had seen. It filled me with joy to know that these little beasties really existed! It made me happy to know that our parks and conservation efforts help sustain habitats that are hospitable for all wildlife. That being said, my excitement was dashed a few months ago when the story of a possible loose dog and a lost mink came to my attention. One of our trail professionals shared that he had found a dead mink down at the Kingfisher Trail. He thought it was unusual because the mink probably died from a broken back, which he speculated may have been caused by a loose dog. His story seemed sound, as I have seen loose dogs many times on that trail. Usually, I help the dog owner to understand that Great Parks’ bylaws require that all pets be kept on leashes. In fact, other than in dog parks, pets must be kept on leashes no long than six feet in length when visiting parks. But alas, this is a difficult law to enforce. There are so many trails in our parks and not enough people to constantly be asking pet owners to do their duty and return their dog to the leash. Perhaps this story may inspire some goodwill of park-goers and people who use the trails to encourage others to do the right thing so no more animals are at risk of peril. Trail walkers can be wildlife ambassadors by passing on the word to people they meet. After all, these parks belong to all of us: the parks are not only a place for people to enjoy the outdoors, but they’re also the parks and homes of wildlife. We welcome all people on our trails and we only ask that you help keep the trails friendly and hospitable for all the creatures and wildlife that call Great Parks of Hamilton County home. For more information about pets in parks and the Great Parks bylaws, visit our FAQs page.